The average Monster Jam Austin tickets at Austin will cost you between $48 and $51, if you are looking for the cheapest seats then catch the event being held on 14/04/2019 for only $48. The average ticket will be at its highest of $51, on 13/04/2019. 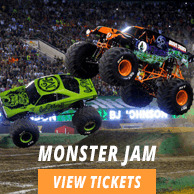 Minimum get in price is for Monster Jam Austin tickets at Austin is $16 for the event being held on 14/04/2019, there are certain dates that have a much higher get in price, for instance the cheapest seats on 13/04/2019, will set you back $23. Monster Jam is back again with more thrilling and stunning motor action. Regular participants include the fan favorites Maximum Destruction, Graver Digger, Black Stallion and McGruff the Crime Dog. Monster Jam is one extreme motor sport that needs no introduction. In just a few decades it has become a well-known name in thrashing and intense truck racing action. It is all about giant oversized trucks popularly called Bigfoot brawling for supremacy. Things are bound to get rough and tough at this exhilarating show so don't miss the action. Quickly get your Monster Jam Austin tickets. Monster Jam has garnered a huge fan following not just in North America but also in other parts of the world. The shows take place the year round mostly during winter season. Monster Jam tours different cities in Canada and the US. Now shows have started taking place in parts of Europe and countries such as Australia, Costa Rica and Mexico. One big event called Monster Jam World Finals takes place regularly at the Sam Boyd Stadium in Las Vegas, Nevada. Monster Jam tour goes to different arenas and stadiums all over the US. This time this bashing event will be held at the Frank Erwin Center in Austin Texas. Located on Red River Street, this multi-purpose venue is owned and operated by University of Texas at Austin.